The University community is especially pleased to welcome Golden Globe nominee Issa Rae, writer, producer, and star of the hit HBO series Insecure, and Amy Goodman, award winning investigative journalist, author, syndicated columnist, and host of Democracy Now!, as speakers for the 31st annual University of Michigan MLK Symposium keynote memorial lecture. The staple event will be held on January 16, 2017, at Hill Auditorium, located at 825 N. University Ave., Ann Arbor, MI 48109, starting at 10am. Doors will open at 9:30am. The event is free and open to the public, and is not ticketed. 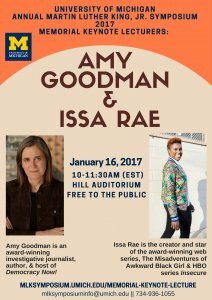 This year’s keynote event will focus on a sit-down discussion between Amy Goodman and Issa Rae. If you are a person with a disability who requires an accommodation to participate in this event, please contact the Office of Academic Multicultural Initiatives, 734-936-1055 at least 7 days in advance of this event (by January 9th, 2017). Please be aware that advance notice is necessary as some accommodations may require more time for the University to arrange.